One thing I love about this time of year is the fresh produce! Even the produce at the grocery store tastes more fresh! If you follow me on Instagram, On Sunday I posted a picture of my grocery cart from Trader Joe’s and as you can see, I am so into fresh fruits and vegetables right now. I think it maybe heat thing? I may have over done it because when I was shopping, I totally forgot that my CSA is also coming this week. Oh well, you can never have too much produce, after all I can freeze it. One thing I do miss this year is my garden. I never got around to planting it. I started prepping it for planting, but I need a new sprinkler system, and I didn’t get a chance to install one. 🙁 Well at least I have Trader Joe’s and the Farmer’s Market to keep me going this year! But next year, I must have a garden!! 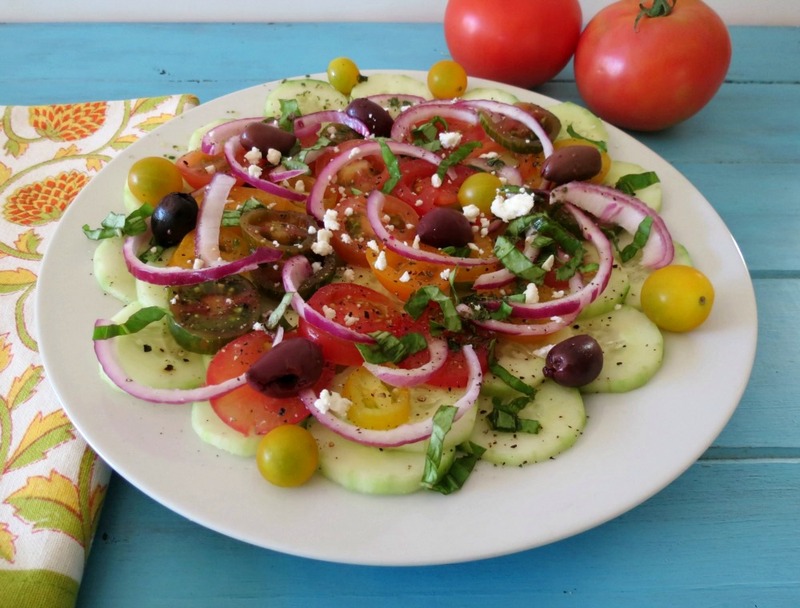 Today I have for you my Cucumber and Tomato Summer Salad. I love dishes like this because it is light, refreshing and so full of wonderful flavor. I could seriously eat salads like this everyday! 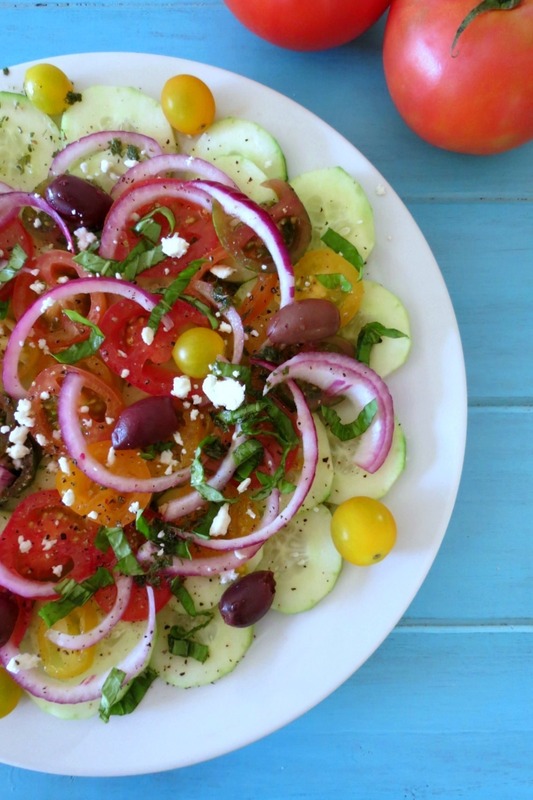 Cucumbers and Tomatoes are one of my favorite summertime combinations. For the tomatoes I used Trader Joe’s mini heirloom ones, but any kind you like will do. I like the heirloom tomatoes because they taste wonderful and remind me of something from maybe my heritage? Plus they have so many unique shapes, sizes and colors. I have even seen purple and brown ones!!! Now onto onions! Honestly, I’m not big on raw onions, but they work well in this salad. I used the red onions, since they tend to be a little sweeter and normally they don’t make my eyes water, but this one did. Darn that onion! I cut them thin and tossed them over my cucumbers and tomatoes. I sprinkled a little bit of salt and pepper and the salad got all juicy with flavor. Love how salt does that to vegetables. I then topped the salad with some fresh basil that I am growing on my windowsill in my kitchen. I guess that is considered my garden this year? For a little bit more flavor I made a simple balsamic dressing that consisted of STAR Fine Foods Extra Virgin Olive Oil and their Red Wine Vinegar. Add a pinch of dried oregano and parsley, give a mix and drizzle over the salad. It was perfect!!! Oh, I almost forgot I also threw in a few Kalamata Olives and a pinch of feta cheese. I put in the recipe, 1 oz feta cheese, but I only sprinkled a little bit on my salad. I just wasn’t in the cheese mood. I think I over did the cheese thing this past weekend. 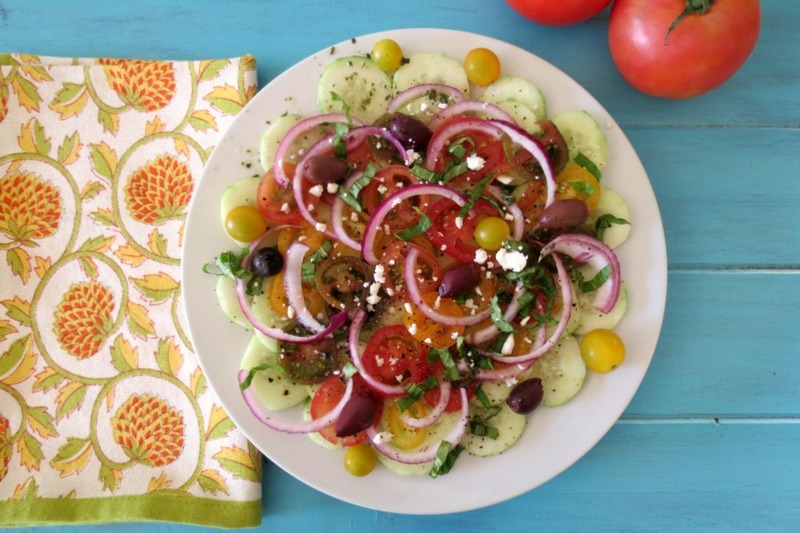 A light, refreshing Mediterranean salad made with cucumbers tomatoes and topped with a simple balsamic dressing. On a plate, add cucumbers, tomatoes and onions; add salt and pepper. Top with basil leaves and olives. In a bowl, add olive oil, vinegar, parsley and oregano; mix well. 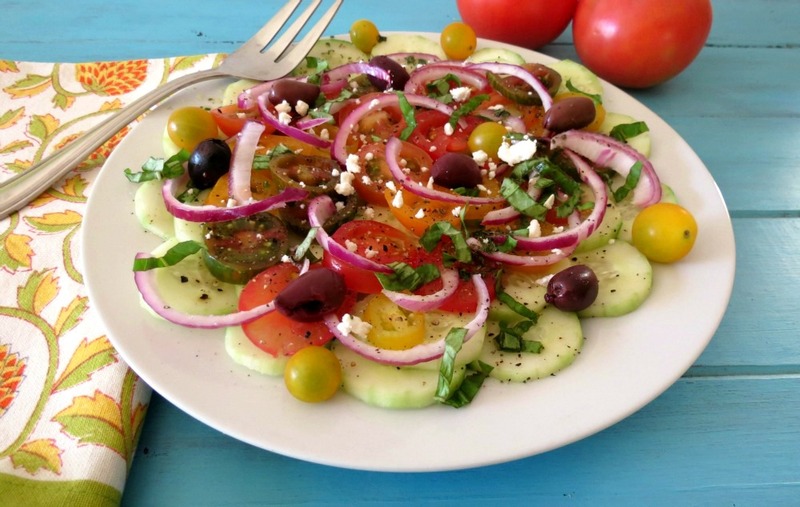 Drizzle dressing over salad and top the salad with feta cheese. 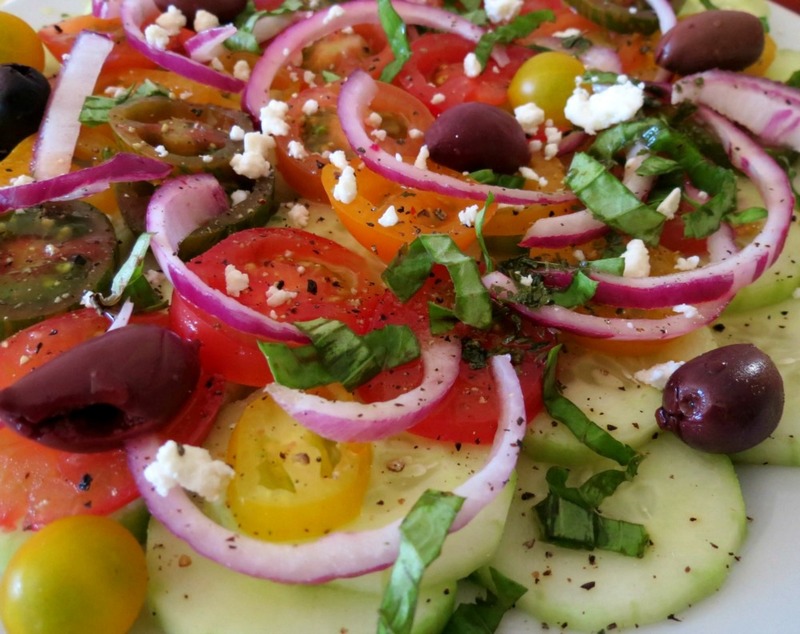 This salad would be perfect to serve at your next BBQ. You can make everything ahead of time, and just put it together when you need it! I also wanted to point out that it’s pretty good the next day too! Since it was a little to healthy for my Husband and he only had a small serving, I had leftovers and had it for lunch. It was perfect! I think I’ll make this again and have it for lunch again this week! Well my friends, my brain is fried today and I probably didn’t make much sense in this post, I think the heat is getting to me. Do you ever get where you just can’t think anymore? That’s me right now, so I am good to say ta ta for now! Have a great day! The winner of the Chobani WTFlavor giveaway is…. Kristen, Congratulation! I have sent you an e-mail, please respond within 48 hours or I shall pick another winner! Congrats again! You’ll love this package!!! 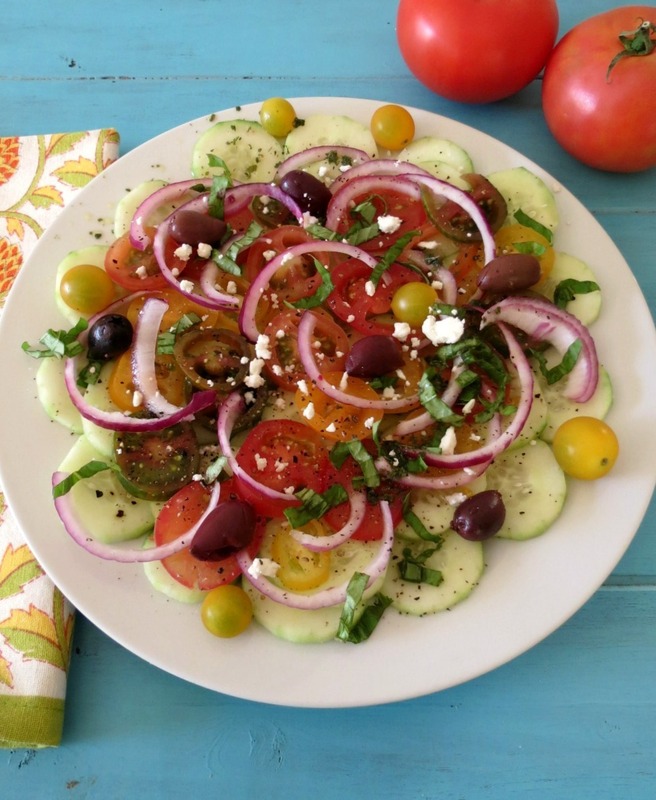 I love everything about this salad, especially the kalamata olives!! I could eat this every day! I didn’t think I liked kalamata olives and then I put them in this salad and now I love them too!! Very refreshing, perfect for summer! Plus these pics are BEAUTIFUL! Thank you Sophia! With this hot weather, I need easy and refreshing dishes!!! How’s life in NY?